Since Park Piedmont Advisors’ founding in 2003, we’ve been writing a series of Monthly Comments and sharing them with our clients and friends. These original writings cover a wide array of financial topics, as well as our thoughts on the bubbles, booms, busts, and bailouts we’ve guided our clients through. We are delighted to share these Monthly Comments with you – to illustrate how we believe in thinking for ourselves, not following the herd. For example: to read what we were thinking in the depths of the financial crisis in late 2008 and early 2009, click here and here. Please contact us if you’d like to read or learn more. We’ll also be posting new content regularly on this site. We’ve organized our thinking and writing into two categories: Financial Life 101 (for people just starting to learn about these topics), and Financial Life 201 (for those with a familiarity with this material). As has been discussed in many previous Comments, interest rates (also called yields) are typically higher on longer maturity bonds, to compensate for the greater price risk associated with having to wait longer to get the initial principal back, called “maturity.” At maturity, investors can buy new bonds at then-current interest rates. When yields on longer bonds fall below those of shorter-term bonds, the investment community labels that an “inverted yield curve”, since the normal yield curve, with higher longer-term rates, has a positive slope. This is highly unusual, but happened during the last week in March. 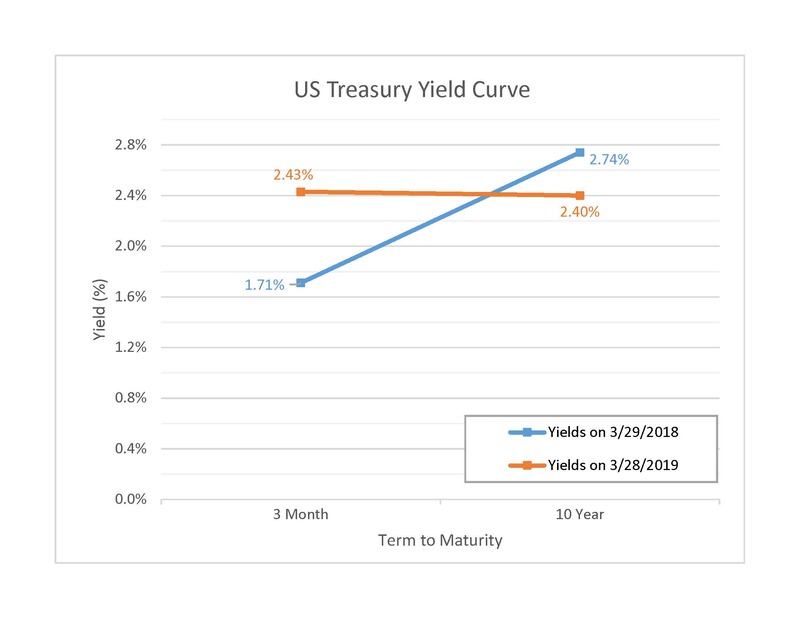 The following chart shows the normal slope of a positive yield curve (from March 2018), and the inversion of that slope with the current (2019) slightly negative spread between ten-year and three-month Treasuries. Even if a recession is on the horizon, it does not necessarily mean stock prices will decline from current levels. As a corollary, it is always possible that the chance of a recession is already priced into the current level of stock prices. Most clients, when starting to use their investment portfolios for part or all of their spending, have as an objective to spend the income but not the principal. We would like to take this opportunity to discuss this objective and why it is so difficult to achieve in a low-interest rate environment. Income is interest on bonds/bond funds and dividends on stocks/stock funds. Total return is income plus or minus the changes in the value of your portfolio. During periods when stock and/or bond prices are higher, total return will likely exceed income. During periods when stock and/or bond prices are lower, total return will likely be less than income. Note also, stock and bond price changes sometimes move in the same direction in the same time frame but sometimes do not, and that stock price fluctuations are far greater than bond price changes. Required Minimum Distributions (RMDs) from retirement accounts are not simply income, even though they are taxed as ordinary income. They are a combination of income and principal based on the composition of the portfolio. Higher-yielding bond-like investments carry more price fluctuation risk than basic bonds, which is why they pay more interest. Annuity payouts are part income and part return of principal, not all income (a subject all its own). Over the last 19 years (early 2000 to year-end 2018), the stock market (as measured by S&P 500 price change only), has gained a surprisingly low 2.6% annualized (S&P 500 index change from 1527 to 2507). If, however, you measure the price gain from the 2009 low (677), the annualized gain is an unusually high 14%. The ten years from 2000 to 2009 were basically flat, with two multi-year periods of very large price declines (2000 to 2002, and October 2007 to March 2009). Assume also that dividends added approximately 2% annually to stock returns over the entire 19-year period. As for bond prices, they also fluctuate, but much less than stock prices. Bond price changes are mostly in response to changes in market interest rates. When rates decline, prices rise, but the interest received is lower. Conversely, when rates rise, prices decline, but interest received also rises. From the years 2000 to 2009, rates declined and prices rose, and the annualized total return approximated 6% (a far better return than stocks in the same ten-year period), with at least half the return coming from interest rates and the other half from rising prices. But at some point, the rate declines stop, and that is essentially what has happened from 2010 through 2018 (with a few years of modest exceptions). Although rates have recently increased slightly, investors have been left collecting relatively little interest income (approximately 2.0% to 2.5% annually on the Vanguard Intermediate taxable bond fund), and are no longer seeing the rise in bond prices. Putting all this information together, you can see that, over the last 19 years, annualized price gains/declines have been quite erratic, and income much more stable. No matter what your allocation to stocks and bonds, for every $1 million in total portfolio value, the annual income was likely to be no more than 2.5%, or $25,000. If the spending need from your portfolio was more than $25,000 per $1 million of capital, some of your withdrawal must have come from the principal value of the portfolio, which is fine as long as portfolios are gaining in value more than the withdrawals. Problems arise when markets and portfolio values decline, and spending is coming from income plus the declining value of the principal. The recent history (since 2000) of market price changes has indicated that there are gains to be expected, especially after periods of decline. But the periods of decline can be quite scary to people living off their investment portfolios. We often see investors trying to earn more income from their portfolios, but there is always some tradeoff with the risk being incurred. We think it makes more sense to acknowledge that principal will likely be spent, unless your principal value is large enough to generate the spending need all from income. (For example; a $3 million portfolio could reasonably be expected to currently generate $75,000 of annual income at 2.5%. If $75,000 is the annual withdrawal needed, then the income may be sufficient). PPA can run illustrations to show how long your funds are likely to last, spending both income and principal, based on assumed investment returns and inflation-adjusted spending amounts. Please let us know if we can be of assistance on this very important matter. Once again, for some time perspective, we are using the chart below from our Special Comments to set out a few price points for the S&P 500 index since Donald Trump’s 2016 election (point and percentage increases calculated from November 9, 2016). Other charts providing long-term context appear on pages 6-9. When stock prices stage such a rapid “U-turn” recovery, the normal instinct is to look for underlying reasons. For January, the financial media has focused on favorable corporate earnings, the Federal Reserve’s comments about holding off on raising interest rates, and progress on trade negotiations with China. Ignored in the explanations for this rally appear to be the US government shutdown and the ongoing negative issues surrounding the president, as well as the drumbeat of expert commentary that a recession is coming, somewhere in the world. Note that corporate earnings reports are continuing, so the Price/Earnings (PE) ratio of the S&P 500 is in flux right now. The PE ratio gives us an idea of how reasonable stock valuations are in a particular time frame. At Park Piedmont, we do not try to divine the reasons for short-term price movements, either up or down. Whether the events that created the 2018 September to December bear market for stocks have somehow dissipated to the point of providing solid ground for the January rally, or whether stocks are simply gyrating in a broad range to accommodate those who trade the short-term price movements of stocks, we simply do not know. We believe only the unknowable future will provide answers. Of course, this simply leads us to repeat our normal advice: try to ignore the short-term price fluctuations, develop and maintain an appropriate asset allocation for your particular needs, and hope that the historically favorable long-term results of the financial markets work in your favor. Turning to bonds, returns were positive again in January, as interest rates on the ten-year US Treasury declined for a third consecutive month, this time to 2.63%. Comments from various Federal Reserve officials that their program of raising interest rates every three months would likely be put on hold for a while seemed to be a catalyst for driving interest rates lower and bond prices higher. It is worth noting that the full year 2018 saw four quarter-point rate increases (100 bps) from the Fed on the ultrashort rates it controls. By contrast, the ten-year US Treasury yield, set by buyers and sellers of bonds in the marketplace, increased only from 2.41% to 2.69%, an increase of 28 bps. When the ten-year rate gets close to the short-term rate, some market observers believe that is a signal for an economic slowdown. The opposite view is that stronger economic growth is likely to continue, and with it the threat of rising inflation, which the Fed tries to limit with its interest rate policies. The debate about future rates of growth will surely continue, but for now, the allocation to bonds in investor portfolios continues to provide positive returns. John Bogle, retired founder of Vanguard and champion of low cost index funds, passed away on January 16th, 2019 at age 89. Two separate articles in the NY Times Business section (NYT, 1/17/19, page B1 & NYT, 1/16/19, page A23) pay deserved homage to Bogle’s contribution to the world of individual investors. The articles cite his emphasis on keeping investment costs as low as possible, and not trying to either beat the market’s long-term results or time the market’s ups and downs. These basic principles should be familiar to you as clients of Park Piedmont Advisors. Since those articles contain many individual recollections of interactions with Bogle, we thought you might be interested in some of the history of how PPA came to be adherents of Bogle’s investment principles. The first major influence was a book written by Burton Malkiel, a Professor at Princeton University who was a major influence on Bogle. As the title suggests, Malkiel’s book, A Random Walk Down Wall Street, took the position that the results of investing are random. As a corollary, investors should try to control what they can, which are costs and the allocation into and out of the stock market. Along came the crash of 1987, when in one day the major stock averages declined by more than 20%. This event suggested to Vic (the only one working in the investment business at that time), that there had to be some better ideas and methods for investors to grapple with uncertainty, the tradeoff between risk and reward, and investing to meet clients’ specific long-term goals, rather than engaging in the apparently fruitless and possibly dangerous short-term trading of stocks. After reading Malkiel’s book, and discovering Vanguard’s low-cost index mutual funds, Vic grew convinced that a sensible approach to investing could be established for families and individuals. The overall downside risk in the markets will always exist, but lower costs and appropriate asset allocations can buffer some of the downside. Thus was born Park Piedmont’s approach to investment advice. Over thirty years later, the approach is still going strong, into another generation, for which we thank all of our clients and John Bogle. Even with no personal interaction, Bogle has been a major influence in the thinking and methodology of PPA, for which we are most grateful. He will be missed. Once again, for some time perspective, we are using the chart below from our Special Comments to set out a few price points for the S&P 500 index since Donald Trump’s 2016 election (point and percentage increases calculated from November 9, 2016). As for the somewhat longer view, the index remains positive, at 15.9% for the two plus years since the election, albeit well below the levels reached in September and November. The article, to its credit, specifically links the current issues to prospects for economic growth and corporate profits. It does not, however, explain why these issues, well known for some time, became such problems during October and then again December. What is not mentioned is that the recent declines in the S&P 500 index have reduced the price (“P”) portion for the index, so that its P/E ratio, which reached approximately 25 during the highs of 2018, has declined to approximately 19 (http://www.multpl.com/), based on trailing 12-month reported earnings. As the P/E for stocks declines, they become more reasonably valued, unless of course the declining prices are correctly foreseeing declines in corporate earnings, which will only be known as the future unfolds. Does anyone remember the volatility of 2011, or the underlying events that were cited as factors back then? Note that since the 2008 decline of 38.5%, the S&P 500 index has gained in all years until 2018, except for two years (2011 and 2015) with basically flat results. Turning to Bonds, prices rose in December, as interest rates on the ten-year US Treasury declined for a second consecutive month, this time from 3.0% to 2.77%. This was surprising, because higher interest rates are one of the media’s main reasons for the recent stock market declines, even though stock prices had moved higher until the end of September (note: the Federal Reserve made its fourth quarter-point (1/4 of 1%) 2018 rate increase in December). One explanation is that the ten-year Treasury price is set by market participants buying and selling these bonds, whereas the interest rates the Fed controls are overnight rates charged to banks (ultra-short term), which the Fed uses to try and modulate inflation rates and economic growth. There are times when there is a divergence in the direction between these two rates, and if the ten-year rate gets close to the short-term rate, some market observers believe that is a signal for an economic slowdown. In any event, for now, the allocation to bonds in investor portfolios is providing positive returns to offset at least some of the stock declines. Two front page headlines from the NY Times, nine days apart, tell a good deal about November volatility, both up and down, for the US stock markets: On November 19th (NYT, 11/19/18, page A1), “Tech Stocks Dive as Wall Street Loses Gains for Month,” and then November 28th (NYT, 11/28/18, page A1), “Markets Soar on Two Words From Fed Chairman.” By the time November ended, the three major US indexes all showed modest month and YTD gains (see page 1). NOTE: The closing value of the S&P 500 on November 19th (as reported in the 11/19/18 article), was 2,691, and the closing value on November 28th (as reported in 11/28/18 article), was 2,744, a 2% difference. The range of high and low for the month was 2,632 (November 23rd close), to 2,814 (November 7th close), a 7% difference measured from the low. By way of comparison, 2018 has had four other months of similar or higher volatility. We will spare you the repetition of the media’s discussions of the day to day reasons for all this volatility, and instead acknowledge that the current financial markets are likely being driven more by current events than by fundamental economics. That said, there is still no reason to change your previously established asset allocations to and away from stocks, even with all this volatility. Long term investors learn to ignore the not uncommon, and noticeable, fluctuations in stock prices. Turning to bond prices, they were modestly higher in November, as interest rates on the ten-year US Treasury declined from 3.16% to 3.0%. This was surprising, because higher interest rates have been presented as one of the main reasons for the recent stock market declines (even though they had been increasing for much of this year, while stock prices moved higher until the end of September). The above mentioned November 28th article provides a rationale for this situation: the Fed may be close to ending its program of increasing interest rates in the future, which presumably benefits stock prices. But, as we always point out, stock prices are impacted by many more factors than just interest rates, whereas bonds are impacted almost most entirely by interest rates. When preparing our Monthly Comments, it is our practice to limit the discussion to the month about which we are writing. That said, we want you to know we are keenly aware of the early December market volatility, and stand ready to write additional one page Special Comments as warranted. We note that as of the close of December 6th, after an extremely volatile day ending with a small change, the S&P 500 index is still slightly above its year end 2017 level, and its recent February and October 2018 lows. We recently read a book we found very interesting, with some relevance to the financial issues we work on with you. It’s called Factfulness, by Swedish physician Hans Rosling, and we encourage you to take a look if you have some time. In the face of much bad news in the world today (financial and otherwise), Rosling seeks to provide fact-based information to counter ten “instincts”, or barriers, that he claims prevent people from acknowledging many slow, steady improvements. He uses UN data to show, for example, that extreme poverty is declining and life expectancy is increasing in almost all countries. And he offers useful advice to help us understand that while certain situations continue to be bad, they are getting better. Chief among these barriers is the “gap instinct”, or the propensity to see the world in binary terms – us vs. them, “the west and the rest”, developed vs developing countries—when the reality is much more complicated. Rosling presents a fascinating graphic on the inside front cover of the book that plots incomes and lifespan (his surrogates for overall wealth and health) for all 195 countries across the globe. Instead of dividing the world in two, he frames almost every discussion in the book around an analysis of four basic income levels, and focuses on how almost all countries have moved up and to the right on this chart (i.e., to more wealth and better health) over the past two centuries. (See YouTube also for a fascinating video called 200 countries, 200 years, 4 minutes, which illustrates the fluidity of this phenomenon. The next major barrier is the “negativity instinct”, which involves an often vicious cycle of media reporting bad news – war, violence, scandal—and people thinking that’s the only news out there. Rosling again urges readers to look beyond the scary headlines to data showing improvements in many areas. He presents charts of 16 “bad things decreasing”, including many diseases, hunger, deaths from disasters, and environmental toxins, and 16 “good things increasing”, including girls in school, literacy and immunization rates, “protected” nature and clean water (pages 60-63). Rosling doesn’t want to be seen as a Pollyanna, but neither does he assume the cynical tone of the eternal pessimist. Instead, he considers himself a “possibilist”, acknowledging that while much work needs to be done, much can, and already has been, improved. The third significant barrier is the “straight lines instinct”, in which people assume that troubling trends will continue at the same rate, instead of leveling off or even declining due to changes that reflect broader improvements. Rosling’s main example here is population increases, which have rocketed upward in the past 100 years. But according to UN forecasts, these increases are expected to grow less quickly over the next 100 years, due to declining birth rates that in turn stem from less poverty, better education, and more access to contraception in lower income countries (pages 80-86). More generally, instead of projecting from just two data points, Rosling encourages the search for additional data that might reveal the real long-term trend. Rosling also addresses a number of relevant financial issues in the context of other barriers. Related to the “fear instinct”, he criticizes the media (page 104) for its often short-term thinking and scare tactics, a view PPA shares often in our monthly commentaries. Rosling provides a useful distinction between perceived risk (or fear) and real risk, which he calculates as danger multiplied by exposure (page 123). This is a helpful way to think about balancing risk and return in your portfolios, specifically by raising or lowering your allocation to stocks (i.e., adjusting your exposure to the “dangerous”, or most volatile, part of the markets). In his discussion about the “urgency instinct”, Rosling explains how we tend to focus on present risks (e.g., daily or monthly ups and, especially, downs in the markets) as opposed to future risks, such as not saving enough for retirement (page 228). He also encourages going beyond a single estimate (page 231), and instead testing at least three scenarios when making projections (e.g., expected, better, and worse), which PPA typically does with your retirement illustrations. And in terms of specific thoughts on investing, Rosling discusses the “destiny instinct” in encouraging investors not to dismiss opportunities in poor but growing parts of Africa, Asia, and South America (page 167). This might lead to an additional allocation to “emerging market” or even “frontier market” stock funds for the international stock part of your overall portfolio. Sadly, Rosling died in 2017 (his son and daughter-in-law finished the book and continue his work). But his writing inspires an infectious enthusiasm for his wide-ranging interests, and we greatly appreciate his concluding plea for humility and curiosity: be humble in the context of a growing, uncertain world, and remain curious about other people, ideas, and possibilities for improvement. During October, US and international stock prices fell sharply, although US stocks continued to outperform international for the year. These Comments will discuss mostly US stocks (we discussed international stocks last month). These figures tell us that even after accounting for serious declines in February and October 2018, US stock prices are approximately 2% higher than year-end 2017, and a very substantial 25% higher since November 2016. Even with all the problems that the media is quick to highlight on down days, US stock prices have gained 25% in the past two years. For much of that time, the markets have known about and been dealing with most of these problems. The more significant issues regularly cited in the media include “President Trump’s trade war with China; the Federal Reserve’s stated plans to keep raising interest rates; signs that labor and other costs could climb; slowing growth in Europe and China; and the tax cuts that increased growth in profits this year will not have the same year over year effect in 2019” (NYT, 10/31/18, page B1). What follows are Park Piedmont’s (PPA) observations about these issues. The overriding question here is: why did dramatic stock price declines occur in October, after reaching new highs over the summer, since so much of this news has been known for many months? Higher Interest Rates: The US Federal Reserve has raised the short-term rates it controls by 25 basis points (bps) three times this year. In 2017, there were also three increases of 25 bps. As the chart on page 1 indicates, ten-year US Treasuries yielded 2.45% at the end of 2016. Through 2017 and 2018 year to date, there have been six quarter-point increases. The ten-year Treasury could yield 3.95% to cover all six increases, but it currently yields 3.15%, well below that rate. Taking a two-year view of interest rates, we see they haven’t risen as quickly as they could have. This is barely discussed in the popular media. The Fed raises rates when it believes the economy is growing too quickly, with the objective of heading off inflation before it takes hold. But most people like a growing economy, which supports more employment, more wage growth, more consumer spending, more home purchases, more business investment, and more business profits. Fed rate increases are therefore not too popular. But at some point, the rate increases take hold and the economy does slow down. That in turn reduces employment, along with the rate of rising wages, consumer spending, home construction, and business investment and corporate profits, which in turn has an adverse impact on stock prices. If the stock market was predicting all this in last month’s price declines, the question is why did it take until October? Another consequence of higher interest rates is that they make investments in bonds more attractive, because investors receive the benefits of the higher rates as existing bonds mature. When bonds become more attractive, there is some reallocation of investor money away from stocks. Higher interest rates also create a stronger US dollar, which has adversely affected a number of emerging market countries that borrowed money in dollar-denominated loans, and now have to find a way to pay the loans back with more expensive dollars. Tariffs and “Trade War” with China: The Trump administration has decided that it is in America’s interests to reduce the trade deficit with China, and to get China to stop stealing technology secrets. To further these policies, the US has imposed tariffs on many goods coming from China, which effectively raises the price of those goods, reduces demand, and, presumably, overall economic activity. China has reacted with its own tariffs on US goods, but is apparently more adversely affected than the US, because its stock market has been down as much as 20% during 2018. This issue has been going on for months, and the media constantly references it as a reason for down days. But how then to account for the up days, and a 10% market gain in the US through the end of September 2018. Increasing Budget Deficits: The Trump administration has also been successful in pressing Congress to pass large tax cuts that primarily benefit large businesses in an effort to stimulate growth in the US economy. With lower tax collections, the US budget deficit has increased substantially, which means more borrowing is necessary by the US government. The proponents of tax cuts take the position that the economic growth will eventually add to the taxes collected, by virtue of more and higher wages for individuals, and more profits for corporations. There are many sides to this question, but why would this be a reason for October’s declines, since it too has been known for many months? Higher Wages Potentially Reducing Corporate Profits: This may be, but these same higher wages create more demand for businesses, and the opportunity to earn more profits. And the same question about why this factor should have been discovered in October remains. Other Political Issues: It is very difficult to factor these in as causation for October’s declines, as they have been ongoing since Trump took office. And as our chart on page 2 indicates, US stocks are up 25% in the two years since Trump’s election. As we have consistently maintained in many of these Comments, causation is difficult to attribute and even more difficult to prove, with so many factors affecting stock prices. Comforting as it might be to offer explanations for difficult times like October, we at PPA have no answers as to the day-to-day (or even month-to-month) swings, particularly since the next day the markets are just as likely to reverse course as to continue in the direction they were going. In other words, volatility is a two-way street; note that on October 29th, the S&P 500 had an intraday range from high to low of 100 points (almost 4%), which corresponded to a 900-point range on the Dow Industrials (also almost 4%). When this volatility strikes the markets, we re-emphasize our advice to think as long-term investors, with a time horizon of years. If you do need money from your portfolio, it is highly likely to be available from the sale of bond funds, which we recommend as part of most client allocations as a buffer against the inevitable times when extreme volatility affects the stock market. As stock prices continue their sharp October declines, we are writing to follow up on our October 10-11, 2018 Special Memo, which also discussed these declines. This memo uses the S&P 500 as a proxy for the US stock market, which closed today, October 24, at 2,656. We highlight a few price points for that index since Donald Trump’s surprise 2016 election. These figures indicate that even with the October declines so far, the index remains substantially positive for the almost two years since the election; still higher than the February 2018 lows; and less than one percent below year-end 2017. Note also that interest rates (ten-year US Treasuries), an oft-cited reason for these declines, are actually lower now than when the serious declines started on October. Trying to time when to be in and out of stocks cannot be done consistently over time. Allocations to bonds and cash equivalents provides a defense against stock price volatility. For example: A 50% allocation to stocks means whatever the percentage decline, your portfolio should be down only half that amount. Please feel free to contact your us for additional conversation. S&P 500, down 95 or 3.3%; Dow Jones, down 832 or 3.1%; NASDAQ, down 316 or 4.1%. Much of the media commentary on the reasons for the declines centers on rising interest rates, but October 10th actually saw a small decline in the ten-year US Treasury benchmark. This makes us wonder why this particular day saw such a sharp stock selloff. That said, there has been a significant rise in the benchmark rate since year-end 2017, from 2.4% to the current 3.2%. During most of this period, stock prices have in fact been rising. Further, stock returns so far this year continue to be better than bond returns, which are modestly negative because of the rising rates. However, bonds have a self-correcting mechanism when rates rise, as the additional interest earnings substantially offset the price declines over time. The issue with stocks is that they have no such mechanism; stocks can suffer serious short-term declines that might not recover any time soon, and can therefore create doubt and unease in the plans of otherwise long-term investors. Which brings us to our constant refrain: Your asset allocation, i.e., the percentage mix of stocks and bonds, is the main defense against the unpredictability of stock price volatility. Our advice, as usual, is to stay the course with your established allocation, designed to allow you to withstand unsettling short-term price declines. A number of recent articles discuss this situation. The Economist Magazine (9/13/18) writes that “Emerging markets are suffering their worst slump since 2015. The MSCI Emerging Markets Index entered a bear market in early September after dropping 20 percent from its early 2018 peak.” The article mentions countries as diverse as Argentina, Turkey, India, and Indonesia, all having trouble supporting their currencies (note three of the four countries constitute less than 3% of the index). The article continues “while each country has its own challenges…the US Federal Reserve has played a key if unintentional role in triggering the stress…. With the American economy enjoying a strong upswing, the Fed has been raising interest rates (note, most recent rate increase on September 26), and also unwinding its bond buying policy….The Fed’s policy turn has left emerging nation borrowers scrambling to get more costly dollars to service their debt.” The remainder of the article presents various opinions on how much more serious these problems are likely to get going forward. Another NY Times article (9/13/18, page B7) discussed the Developed Markets in Europe. Citing the negative impact of US tariffs, the article states that “the European Central Bank (ECB) has lowered its projections for economic growth across the 19 nation euro area, and warned that any potential escalation of the dispute could create further headaches.” The article also notes trade risks associated with emerging market problems, particularly in Turkey, along with issues related to striking a deal with Britain regarding “Brexit.” The conclusion of the article however states that the ECB will continue with its plans to cut back on the stimulus programs that were put in place after 2008, in much the same way that the US has cut back these programs, albeit the US economy is much stronger than the EU at this time. The EU outlook currently appears to be much more mixed than that of Emerging Markets, which are wrestling with debt, interest rate, and growth issues. Despite the current underperformance of Developed International and Emerging Market stocks, we at Park Piedmont continue to advocate some exposure to these sectors as part of a broadly diversified portfolio, particularly since their PE ratios are in the mid-teens, compared to much higher US stock PE ratios, which have climbed to the mid-20s. When PE ratios show this much divergence, it can be argued that the lower PE sector represents a comparative value when compared to the higher PE stocks. As always, only time will tell if this proves correct.